When I think of making a fruit dessert, my mind naturally goes to a crisp, with its crumbly, granola-esque topping that's the perfect counterpoint to the sweet, cooked fruit beneath it. But some fruit, and I'm thinking of you, stone fruits, seem to pair much better with a cakey biscuit crust, the better to sop up the juices oozing from the warm fruit. 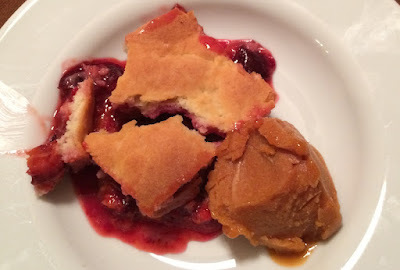 Recently, friends were due to come over for dinner, so when I got a couple of pounds of very ripe Damson plums and several pounds of Golden Gage plums from Ayers Creek Farm, it seemed only right to make a cobbler with the Damsons. Which inspired Dave to make a sorbet to accompany it, using the Gages for a little plum-on-plum action. In large bowl, combine filling ingredients and stir gently. Place in 9” by 12” baking dish. Mix flour, sugar, baking powder and salt in food processor. Pulse to combine. Add butter or margarine in pieces and pulse until it's the consistency of corn meal. Add cream or milk and process till mixed and soft dough forms. Using spatula, scoop out onto heavily floured surface. Roll or pat out, using flour as necessary to make sure it doesn't stick, until dough is the size of your baking dish. Carefully lift it up and lay over fruit. Bake 25 to 30 minutes, or until the topping is brown and fruit is bubbling around the edge. Let cool at least 10 minutes before serving. 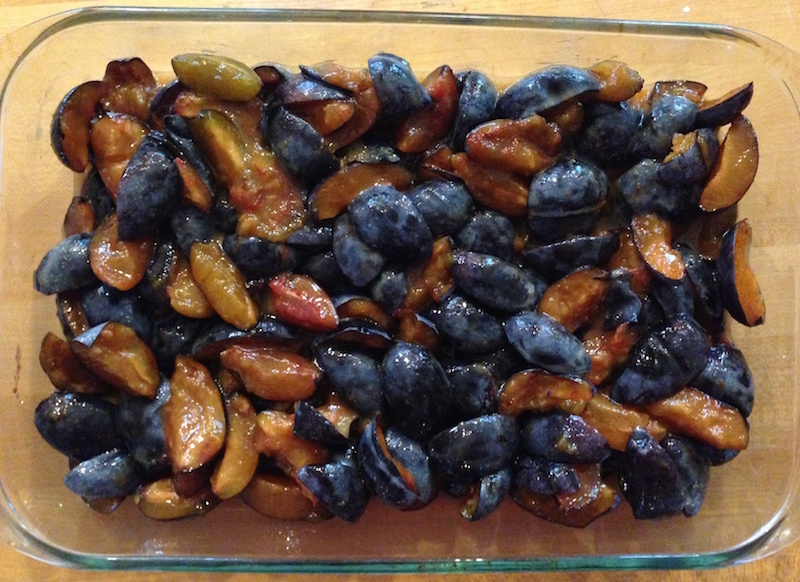 Pit and quarter whole plums, leaving skins on, and place in food processor with lime juice and sugar. Process until it's a fine purée. Pour it into a fine mesh sieve (in batches if necessary) over a large mixing bowl and, using a wooden spoon, stir and press the purée through the sieve. (This step is super easy and not time-consuming, so don't let it put you off.) Stir in the vodka, then place a piece of plastic wrap directly on the surface of the purée. (This keeps it from oxidizing and turning brown.) Place the bowl in the refrigerator for 2-3 hours to chill completely. Put chilled purée in ice cream maker and process according to directions. Place in container in freezer for 2-3 hours, then serve.